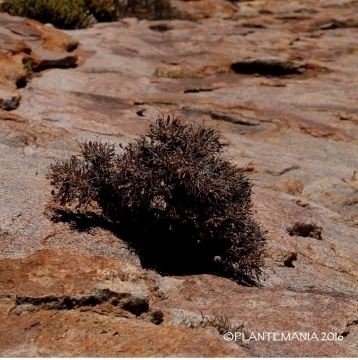 Habitat: Grows in rather inaccessible solid granite rock domes squeezed into crevices in very exposed situations, specimens often existing on a thimbleful of soil as the sole inhabitants of microscopic horizontal fissures running along steep cliffs. One wondered how they ever obtained any moisture or other nutriment. In its local habitat, from May to August, when plants grow, the weather is cold, and temperatures sometimes dip below 0ºC. 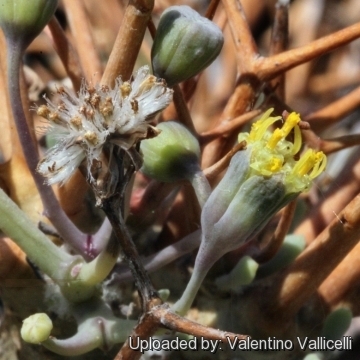 Description: Othonna euphorbioides is a remarkable caudiciforms species with the habit of a miniature spiny succulent shrub, broader than tall barely 10-15(-30) cm tall. 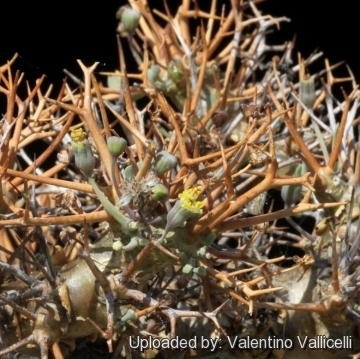 It is the most cactus-like of all succulent Compositae (near Senecio) forming spiny masses of succulent stems seemingly remote from the better known Othonnas. 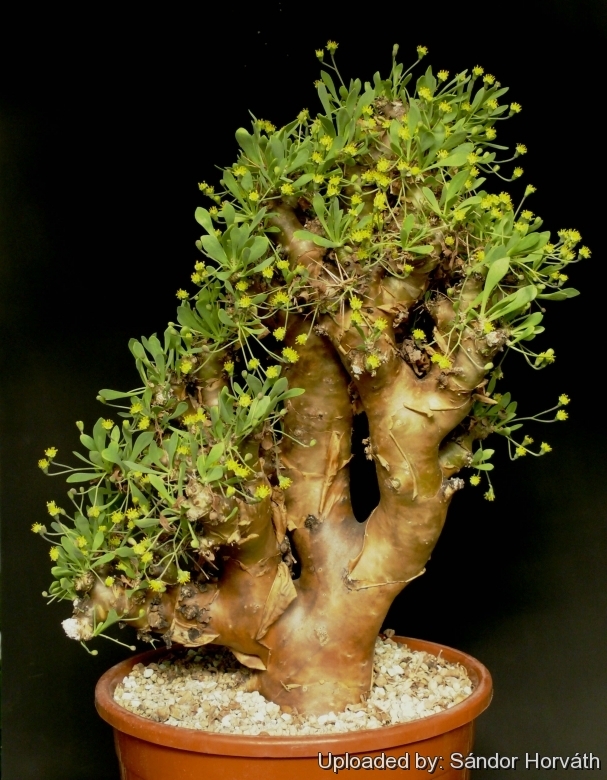 This plant acquired its name by resembling many of the spiny succulent euphorbias. 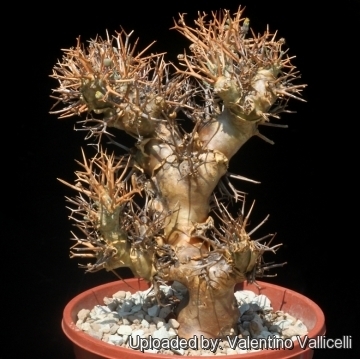 Caudex: Potato-like with short sparse branches, covered with greyish powder. 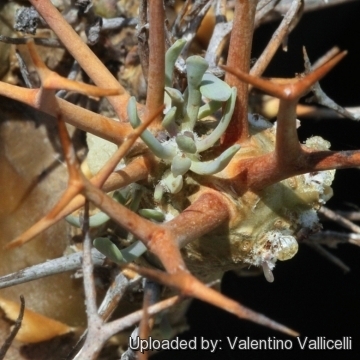 Spines: Bears branched spines, that may fork or retain shrivelled floral remnants. 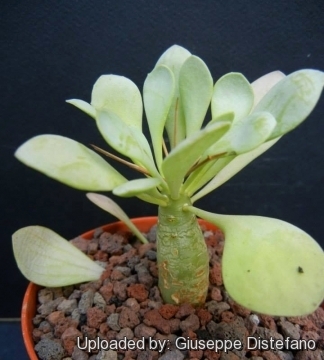 Leaves: In tufts at ends of branches borne amongst compact arrangements of spines, elongate-spatulate (spoon-shaped) 3-4 cm long, light green, covered with white pruinose powder. 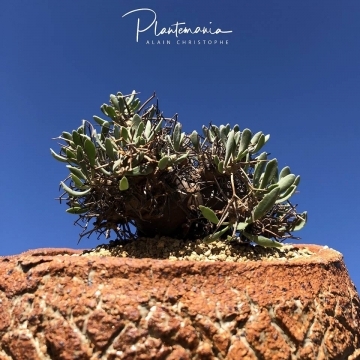 Remarks: This plant is one of the few species that contend 'areoles' to cacti, other contenders for "pseudo-areoles" with more than two spines are Euphorbia dasyacantha and Euphorbia horrida. 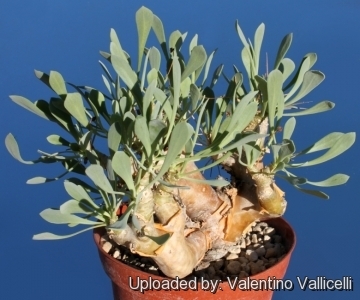 Cultivation and Propagation: O. euphorbioides is one of the easier species to cultivate. They must be grown very hard in the nursery as close to the natural conditions as possible. This ensures that they keep their compact habit.